Abaco Bahamas Air Carriers and Charter Airlines. 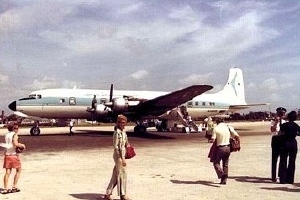 Mackey 1973 - Old Treasure Cay Airport - a DC6 no less. It used to be that flying to the Abacos on the small 9 seat Cessna 402 commuter is half the fun of a quick fly over from south Florida. It's just an hour flight. The small plains fly at lower altitudes so you can almost see the fish in the turquoise waters near the islands. I think of them as sport cars as compared to a bus. They zip in and out of clouds easily bypassing any thunderheads. Oh, that 9th seat, actually a copilot's seat, was generally filled by a passenger as chosen by the pilot and usually blonde and female. The only negative is, the longevity of these small carriers. All of the aforementioned have come and gone, and you can add to them Locair, Yellow Air Taxi and Twin Air. 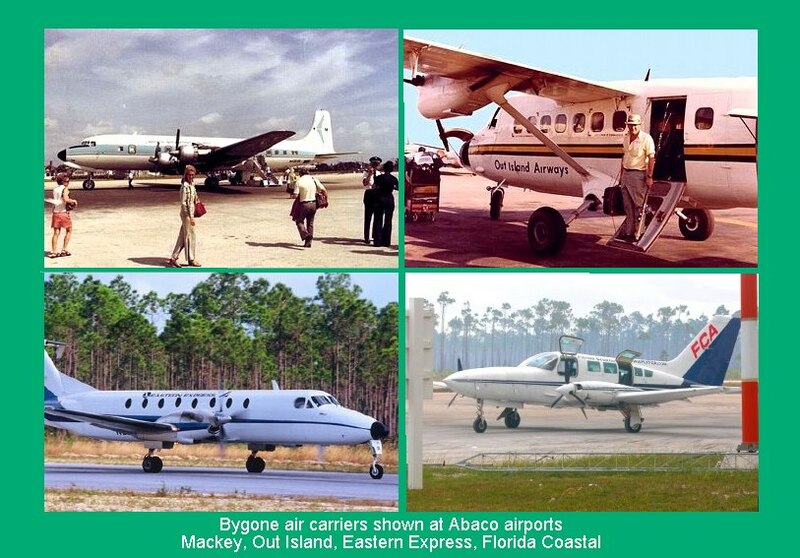 In our years flying to Abaco, there have been a half dozen carriers that we have flown that no longer exist. Some ceased within a year of our first flight. Still new carriers arrived to fill the void and like their predecessors disappeared. 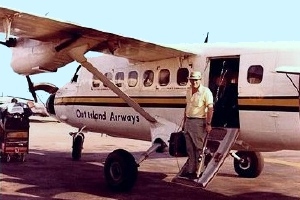 2007 & 2008, Chalk's International Airlines, a name synonymous with out island air service, had been resurrected and started flying to the Abacos and a new fleet of leased aircraft including 50 seater jets was promised. Then by the end of the summer they ceased flying due to the loss of it's federal operating license. Island Express Airline closed their hanger doors and no longer flying. Subsequent to that we hear they only had a single leased aircraft. No wonder. Then sadly on top of that, mid July 2008, saw the long time and pretty much reliable carrier of 16 years, Vintage Props & Jets filling for bankruptcy. As for the Vintage routing (NE & Central Fla) or loss thereof, the slack was picked up by, Island Pass, Craig Air and Air Gate. And within 8 months Island Pass was gone. About the time of their demise, Locair came on the scene with direct flights from the west coast of Florida at St. Pete. As Sarasota residents, we used then in 2010 and it was fantastic. By 2011 they were gone. Lastly, 2014 saw Regional Air disappear quite literally. Their phones their phones & E-mail just stopped being answered in both US and in the Bahamas. At the same time Sea Plane service with Tropic Ocean Air was to begin landing you directly at White Sound by the Abaco Inn at Elbow Cay. There hasn't been a second flight. Still at last check their website was still up. A couple of our remembrances. Back in the 70's, A friend on a late arriving private aircraft touched down just after the airport closed (the airport runways are not lit and they close at sunset). He and and his wife not finding anybody of authority, hailed a cab to the ferry dock where I was waiting. Both worried about having not clearing customs, stated that to the taxi driver. He said not to worry and drove them back to the airport. Asked for their passports, took them inside and stamped them. He later informed them, his brother was the customs man and he has a key to the office. - No Problem Mon! Back in the 80's. Once during a take off at the Treasure Cay Airport, the pilot abruptly aborted takeoff of the Cessna, turned around, headed back to the other end of the runway and repositioned himself for another try. Since I was sitting right behind him, I asked what happened? He simply replied, he didn't like the sound of the right engines and proceeded to take off again. A month after 911, We flew over for a week taking advantage of the discounted rates. While at the Green Turtle Club, we befriended a Canadian couple who happened to be on our return flight. He nodded to the pilot and asked, "Aren't you the pilot that flew us over last week?" The pilot remembered him and their conversation and the fact that the Canadian fellow was also a pilot. The pilot invited him to the copilot's seat and asked if he'd like to take the stick after take off. "Absolutely he'd be happy to" was the reply. 2005 saw this one: My sister and husband were returning on Continental/Gulfstream which took them from Marsh Harbour to Ft. Lauderdale connecting to Phila. As it were, there was a delay of another Continental flight to Palm Beach which was supposed to arrive and depart prior to theirs. Well, theirs being the only Continental plane, ground crew loaded both the Lauderdale and Palm Beach baggage in the same plane. Shortly after take off, this mistake was realized and my sisters flight was called back to Marsh Harbour for the unloading of the misplaced baggage. They took off again, luckily in time to make her connection. Also in '05 (Florida Coastal Airlines was our carrier of choice because of Sarasota being part of their route. Little did we know they wouldn't be in business the following year). On our return leg, We disembarked in Sarasota. And while I was waiting for the "one man office manager, counter clerk and porter" to cary in my bag which took all of five minutes, I realized I left my camera aboard the plane. Well in the five minutes it took to get us our bags, and because the pilot had no pickup passengers, he was already heading down the runway and back to Ft. Lauderdale. What to do? John, the one man Jack of all trades for FCA called the tower who called Norm our pilot who confirmed it was there. He left it on the seat to return to me the following day but dispatch switched planes on him and my camera took off for Stuart. Woe is me. But John tracked it down and I finally got it that evening. Imagine that kind of service from a major carrier. It's just a darn shame they are no longer in business. The New Airport at Marsh Harbour! Silver Air adds Tampa. Delta adds a new Atlanta - Marsh Harbour non stop. Southwest begins flights Lauderdale - Nassau (requires BahamasAir connection to Abaco). Abaco, so close yet so far. The superlatives to describe Abaco abound but getting there can tricky if coming from afar. Just about all flights will have to connect in a southeastern US city - Miami, Ft. Lauderdale, W. Palm Beach, Orlando. Tampa and now Atlanta. This makes timing your connection difficult for any flights of distance. Flights via Nassau make connections unpredictable especially for your baggage. Chartering: Sounds like it�s only for the rich and famous. For a family of six or 3 couples, NOT SO, and can offer many pluses. Namely you can fly into Treasure Cay and back from Marsh Harbour if it suits you. AND that's on your own schedule arriving and departing, allaying connection concerns. You avoid long custom and security lines, no lost luggage, and no hassle. It could be well worth it. IE: the plane is yours, and you can bring as many bags as you like, a cooler, even your dog. Our recent favorite has been.... whose ad you see above offers weekly scheduled flights to Marsh Harbour & Treasure Cay plus charted flights also. Non stop flight time if typically about one hour from the aforementioned cities. Their staff will be eagerly waiting to help in every way. They can be reached by clicking on their ad above. IN A NUTSHELL, most all Abaco travel connects or originates in Florida with the four US Carriers. USAir/AA flying as American Eagle/Envoy out of Miami & Charlotte to Marsh Harbour. Delta Airlines flying as Delta Connection has service to Marsh Harbour from Atlanta. Nassau requires a Bahamas Air connection to Abaco. Bahamasair has nonstop flights to Marsh Harbour four days a week from Palm Beach. They also fly from other US Cities with connections via Nassau. Note: Schedules do vary seasonally, often reduced to weekends only. In this regard, re-confirm flights regularly as they can be dropped especially late summer early fall. Abaco, Bahamas Air Carriers, Scheduled (bold) and Charters, as of Jan 01, 2019. Via Marsh Harbour, (MHH) serving South Abaco, Guana Cay, Elbow and Man-O-War. Via Treasure Cay (TCB) serving North Abaco, Green Turtle Cay & Spanish Local Abaco and US phone numbers listed. The US area code for the Bahamas is 242. Some guidelines to consider when planning your trip. 1) If you are considering going in high season, May, June, July or around Christmas and especially on weekends during those periods, book well in advance. This applies not only to airlines but boat rentals and to a lesser degree, golf cart rentals. 2) Reconfirm your flight a few weeks prior to departure to avoid any surprises. 3) Use carry on luggage if you can, in case you have to change flights in a hurry. 4) Late arrivals could cause conflicts trying to catch the last scheduled ferry to your Cay resulting in an expensive charter. 5) Get to your departing flight early. The is not to deal with lines, but to allow time for your passport number to clear with Homeland Security in the US. It�s not uncommon to hear of a passenger arriving 15 minutes before departure and not be allowed to board. 6) If you have an early AM flight, you might want to consider a day in Marsh Harbour before your leave - Rent a car and South Abaco and it's settlements. The Lofty Fig and Conch Inn allow one night booking. 7) If you have a choice when changing planes in southeast Florida, try to use West Palm Beach, Ft. Lauderdale and Miami in that order. Orlando better. An earlier trip had us connecting through West Palm Beach. Including baggage pickup, customs and immigration, we were at our departure gate for Tampa in about 15 minutes! 8) Connections to Abaco in NASSAU via Bahamasair require customs clearance and can often result in missed connections and increase your odds of lost or late arriving luggage. 9) One last consideration if you find yourself aboard the popular Cessna 402 - a small 8-9 seater; Weight is more critical and all passengers luggage will be weighed and checked. If the combined weight is too much, it could be possible that your bags might follow on another plane. It's happened to us.